In May of 1553, two young girls, the granddaughters of Henry VIII's sister Mary Tudor, were hastily married to men of their parents choosing. They were the hapless pawns in a brutal scheme by the King's chief advisor, John Dudley Duke of Northumberland, to seize the throne of England. Against her will, seventeen-year-old Lady Jane Grey was wed to Guilford Dudley, the son of the scheming duke. Simultaneously, her sister, Catherine, was wedded to the heir of the Earl of Pembroke. 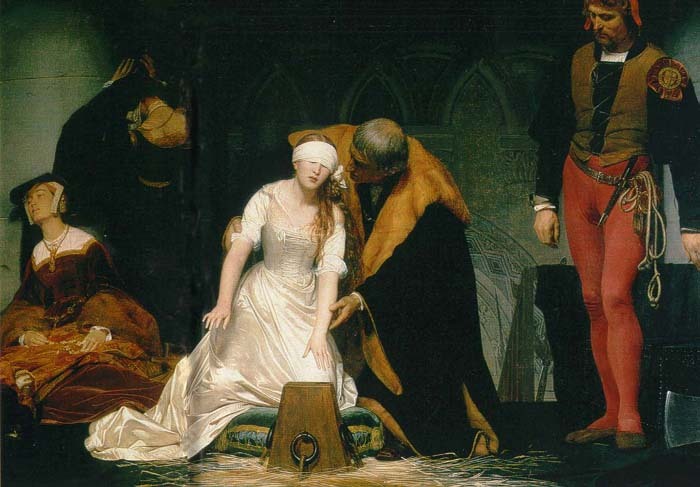 In less than one year the pious Lady Jane would be declared Queen of England, deposed, and beheaded. Like most British subjects, Jane and Catherine assumed that the crown would fall to one of King Edward's two older sisters, Princesses Mary or Elizabeth. Catherine was only 14 years old and totally unaware that Jane and she were next in line for the throne of England. 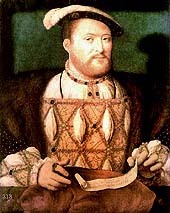 Edward's father, Henry VIII, had his first marriage annulled by an act of Parliament so he could marry Anne Boleyn. This Act also disinherited his first daughter Mary. Elizabeth, Henry's second daughter by Boleyn, was also disinherited by her father when he had Boleyn beheaded for adultery. Edward would further strengthen the disinheritance with a Device of Succession. Later the courts would reverse these decisions. (continued) Under the Act of Succession, if Henry's third child, King Edward VI, died childless and the Princesses were not eligible, then the throne would go to the heirs of Henry's eldest sister Margaret who married King James IV of Scotland. Her heirs were also women, Mary Queen of Scots and Lady Margaret Douglas. But since they were both Scottish, Henry VIII made it very clear in his will before he died that he didn't want the throne to go to them or to any Catholic. Therefore he declared that the children of his niece, Lady Frances Brandon, would be his heirs if Edward failed. Lady Frances was the daughter of Henry's favorite sister, Princess Mary, and his best friend Charles Brandon. Lady Frances married Brandon's ward, Henry Grey, when she was only 16 years old, then bore three daughters—Jane, Catherine, and Mary. Jane was born within days of the birth of Prince Edward and many believed that the two little cousins would marry someday. Their families were very close and they both had an intelligence and seriousness uncommon in children. It was almost as if they knew that they would never live to see their eighteenth year. While Jane was being groomed to be a queen, petite Catherine was left to her dolls, needlework, and girlish dreams of love and marriage as a daughter in the noblest family in England. Their dear cousin, Edward VI, developed tuberculosis after a bout with the measles and was failing fast in the late fall of 1552. 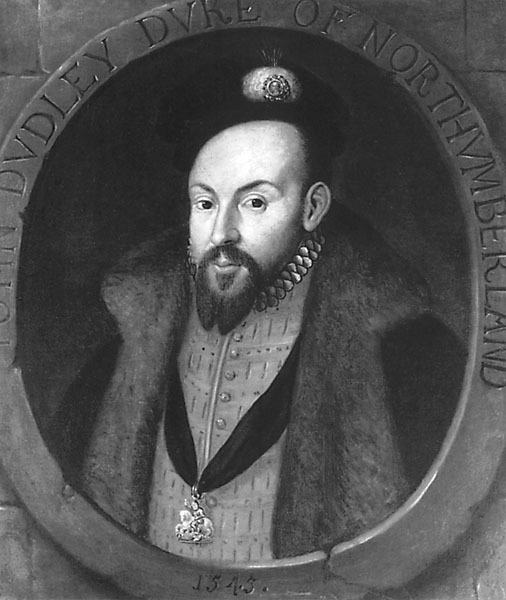 John Dudley, duke of Northumberland and chief advisor to the King, had already begun executing a plan to make his son King by marrying him to Lady Jane in 1551. Though Mary Tudor was still legally next in line under Henry VIII's Act of Succession, a new Device for Succession was drawn up and signed by Edward VI, just weeks before he died, that excluded Mary and Elizabeth and made Lady Jane and her male heirs next in line. 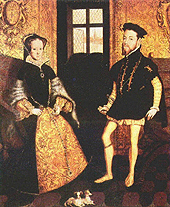 Dudley secured support for Jane in the weeks leading up to Edward's death late in the evening on July 6, 1553. The news of his death was suppressed to prevent Mary from learning of it. On Sunday, June 9, Jane and her sister were brought to Syon House were many nobles were assembled. They bowed and knelt before Lady Jane with all reverence, which embarrassed the pious young woman. Then Dudley told her that Edward was dead and she was now Queen of England. Dudley's plan to make her queen was now apparent to her and, though she felt inadequate to the task, she realized that she was trapped. She uttered a prayer to God for his help to govern England and said nothing more. 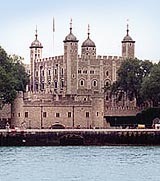 The next day she processed from Syon to Westminster and then took a barge to the Tower of London to be crowned. When the Lord Treasurer brought the crown to her to see if it fit he let it slip that a second crown was being made for her husband, Guilford. Jane finally understood the enormous duplicity of Lord Dudley and became enraged. She swore before those assembled that she might make Guilford Dudley a duke but she would never make him king! Guilford rushed out of the room red-faced, and ran to his mother. She came in and railed at Jane for being ungrateful, willful, and an unnatural wife. Jane banished the duchess of Northumberland and when Guilford tried to leave with his mother, Jane had her men restrain him. She might have been angry with him, but she still wanted him to act his part as her consort. That night the Sheriff of London proclaimed Jane Queen in the streets and was met with stunned silence. Jane was not popular with the people, who saw her as a usurper and a puppet of the unscrupulous Northumberland. 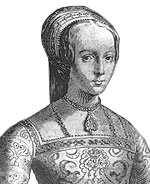 The people favored Mary Tudor because they had always been sympathetic to her mother Katherine of Aragon, who had been shoved aside so that Henry could satisfy his lust for Anne Boleyn. The people never believed that Mary Tudor was illegitimate and many were still secretly practicing Catholics. Mary had been summoned by John Dudley to visit her stepbrother, who was failing fast, when she learned that Edward was already dead and the summons was a trap. Mary quickly retreated and wrote the Council demanding that they proclaim her Queen. They wrote back that Jane was the rightful queen and she should demonstrate her obedience to the "Sovereign Lady Queen Jane"' and turn herself in to the authorities. Thus, with counter claims to the throne, the only course was battle. As Mary advanced toward London, town after town rejected Jane and proclaimed Mary queen. Dudley sent ships to Framlingham to cut off Mary's troops, but the captains and crews switched sides and joined with Mary. All of Dudley's plans began to unravel as his troops lost heart and the lords, who only 9 days earlier had knelt to Jane, fled and claimed they had always supported Mary. On July 19 Mary was proclaimed Queen and there were celebrations in the streets of London. Jane was imprisoned in the Tower with her whole family. Mary quickly released Jane's mother, her sisters, and her mother-in-law. Queen Mary took Lady Frances and her daughters Catherine and Mary as ladies in waiting and showed them much favor. But Jane and her father stood accused of stealing some of the crown jewels. It is altogether possible that Jane's father did steal some of the jewels to fund the defense, but the truth is unclear. Dudley was found guilty of treason and executed on August 22. Jane was tried and found to be 'morally innocent' but still guilty of treason and thus condemned to die. However, Mary showed mercy and commuted the sentence, keeping her imprisoned in the Tower. Henry Grey was allowed to pay a large fine and was released, mainly due to the entreaties of his wife. It is interesting to note that Lady Frances never pleaded for her daughter's release the way she pleaded for her husband's. 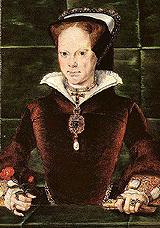 Queen Mary I, 37, was planning to marry Phillip II of Spain, who was 26, in October on 1553. The people were outraged. They believed that the queen would probably die childless and leave the crown to her younger husband, thus making England a Spanish holding. Rebellion broke out in the country, and Henry Grey was in the thick of it again. It was rumored that he tried to raise troops by proclaiming Jane the rightful Sovereign. The Queen's troops were able to put down the rebellion and, after capturing Henry Grey cowering in a tree trunk, and she imprisoned him again. 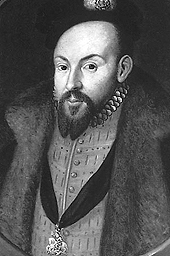 Phillip's councilors urged that the traitors be punished—that meant removing the Protestant rebellion's figurehead so no further rebellions could be formed. The Spanish ambassadors told the Queen that her future husband would not set foot in England until Lady Jane, her husband, and father were executed. Until that time Mary had shown great mercy and restraint but this was her turning point. 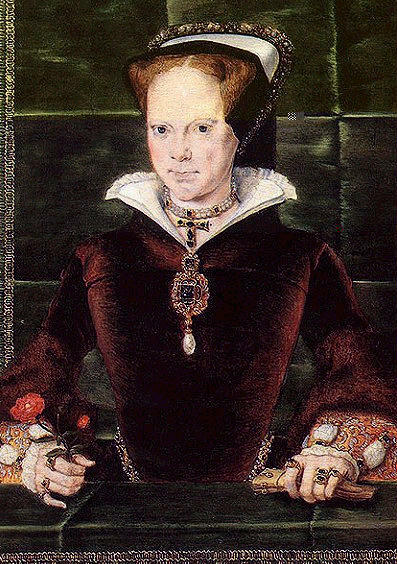 Because she wanted to marry Phillip and restore England to Catholicism, she chose to execute them and persecute Protestants from that day forward and thus earned herself the name "Bloody Mary." The executions were held on February 12, 1554. Jane wrote letters to her father and her sister Catherine before she died. Her writings have been preserved and earned her the title of the first English Protestant martyr. Your loving sister, Jane Duddley"
Lady Jane, the Queen of England for only nine days, will always be remembered for her courage and conviction to her faith, even to the death. Next issue Part II: What happened to Lady Catherine Grey? See links below for more information on Lady Jane Grey. British Monarch's Family Trees with the dates of their reigns, births and deaths. Biography of Lady Jane Grey, by Marilee, part of the Tudor Relatives website, beautifully written. Lady Jane Grey, Queen of England for nine Days by Sarah. Another sensitively written site that is rich in details. Lady Catherine Grey the younger sister of Lady Jane Grey. Lovely article about Lady Jane Grey! I'm surprised that you don't mention the youngest of the three Grey sisters, Mary. She was the tiniest — evidently only grew to about four feet tall — and was one of Elizabeth I's maids-of-honor. Like her sister Catherine, she too made an unlucky marriage — to the tallest man at court, Thomas Keynes. Elizabeth was not too pleased about this, and placed them both under house arrest, in different locations. Too, in a recent book on England's Queen Mother, I discovered that she was a descendant of Catherine Grey and the Earl of Hertford. She is the subject of Part II. 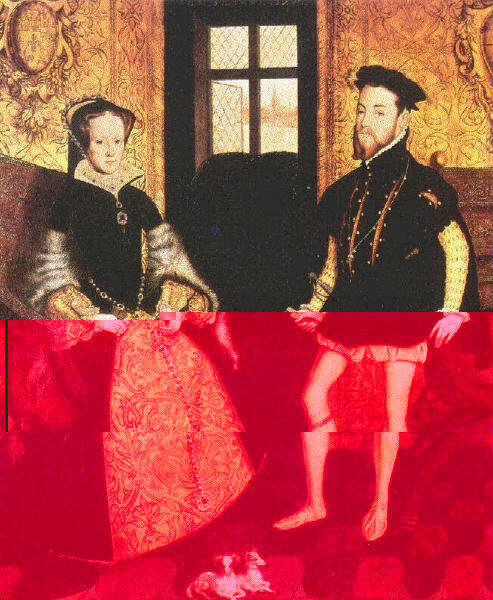 Thank you for the extra information on the third daughter, Mary Grey's and her husband's size difference, I didn't know that, or that the Queen's Mother was a decendant of Catherine's. If you want to add this article to your list of favorites or email it to a friend, please use this permanent URL, https://stores.renstore.com/biographies/the-queen-of-9-days. Permission is granted by the author to quote from this page or use it in handouts as long as you include a link back to Renstore.com.